“Shouldn’t we be cooking with more beer?” our Sous Chef asks at the menu planning meeting. We’re gathered around a four-top table in our taproom, morning light coming in through the windows and closed metal gates, reflecting off the polished brass tables and chair legs in the air, turned upside-down from the previous night’s cleaning. “Not more beer, more seasonal fruit,” Chef responds. We move on to the next menu item up for review. Everything is on the chopping block: how can this dish be made better? How can we tie it more deeply to our beer offerings? How can we create something new, something special, something Almanac? The flavors, pairings, and beers are changing: what stays the same is the connective tissue linking everything together: an ambition to make our combination more than just putting beer and food together in the tried-and-true sense of pairings. We want to move the conversation forward, to explore with the same inspiration that pushes us to be better brewers. The name Almanac was derived from the Farmer’s Almanac, and we hope it conveys that our beers have been infused with terroir, or a sense of place. The idea that when you drink them, the experience links back to where they are produced. But what is the sense of place when you eat in our taproom? They needed to share a genesis. We’re four and a half months in since Almanac's San Francisco taproom opened on New Year’s Eve 2016. Spring is turning to summer: fava beans, asparagus, and unripe white strawberries—you pickle them, and they're delicious: same strawberry flavor, but more firm and savory—are coming off the menu. Peaches, tomatoes, shelling beans, cherries, and blueberries are all available now as new ingredients as we discuss fresh menu ideas. What seems like a lifetime ago, I was a beer and food blogger, (I’m sometimes proud and sometimes ashamed of saying that in public.) But what drove me then to write “Beer and Nosh” was writing up new restaurants, cooking and pairing at home, reviewing new beers and breweries as they opened. If you enjoy poorly-lit photography and typos, you’d love it. I’ve also been doing beer dinners since before Almanac existed. I collaborated with local chefs and worked together to host events where I pulled in some of my favorite local beers and worked as the glue to connect them with local food. I banished all traditional options: no pretzels, no sausages, no “beer food.” Pairings were always based on flavors, not on tapping into traditional beer cuisine. We matched IPA with dessert (no seriously, try it), with sours taking the place of a Champagne pairing. I wanted real food. Wine food. San Francisco food. I wanted my pairings to be editorial—for them to say something, to offer an opinion, a new experience. Something almost approaching nascent vision of what beer and food could be together. I didn’t know at the time that that’s exactly what I would want from a chef in a restaurant I never thought I’d own, serving it up alongside beers I never thought I’d be making. When I met my Almanac business partner Damian though a local homebrew club, we shared a love of San Francisco restaurant culture, and a clear market niche we could nestle into: culinary minded beers, brewed with the same farm-to-table ethos that drives so many restaurants, but inexplicably failed to appear on the beer menus of said restaurants. Delivering beer out of the trunk of our cars on nights and weekends, we established relationships and friendships with some of the best eateries in San Francisco. We got new business because chefs tried our beers at restaurants they loved. We collaborated on beer dinners to showcase how beer can go toe to toe with wine, often beating it on its home turf. That was five long years ago. Today, local fresh beer is the norm anywhere with a serious beverage program, and the number of breweries in the Bay Area has skyrocketed. Instead of a single bottle of Sierra Pale or Anchor Steam, you'll find a selection of IPAs all brewed within an hour’s drive, and know the name of the brewer who made it. Beer isn’t a faceless commodity, but a part of the local food community. And Almanac isn’t some small startup putting out our first beer—we’ve grown, evolved, expanded, and flourished in this new landscape. When a restaurant in the Mission abruptly closed and the space was offered to us, a new path unfurled: a taproom that combined our love of barrel-aged beer and fresh IPAs, that was teamed with a kitchen that offered more than just “beer food.” I realized I didn’t just need a kitchen that would make good food for our beers. I needed a kitchen who would align with our beer, and challenge us as brewers at every stage with a own point of view on what constitutes seasonal, local, sustainable, a sense of place. We were going to have to bring on a creative partner. Interviewing chefs for a job always looks like amazing fun on Food TV. A chef arrives, knives in hand, and prepares a restaurant-quality meal for a small group of tasters. One dish after another, they put everything on the plate, impressing the judges with their creativity, seasoning, perfect knife skills, and roasted meats. They cook, and we sit and wait to pass judgement as they try to meet the standards I laid out. We consciously plan the tryout for Almanac's chef candidates in order to set them up for success—we laid out loose guidelines, and let them shop, prep, and cook on a schedule that works for them. No tricks, no surprises, no Chopped or Iron Chef challenges. We wanted to give them the best chance to really impress us. Of course it didn’t work out that way at all. From the very first dish from the first chef we interviewed, a raw, nervous energy pervaded every plate. An appetizer would be placed in front of us, and I’d look at it, maybe unfairly asking, “Does this represent the sum total of what Almanac has done for beer and food? Does this push beer and food pairing forward? Does this reach the highs we imagine of combining great beer and food together to be something more than the sum of its parts?” Usually by the halfway point of the meal I’d be looking at the exit doors, wondering how much longer it would last. It wasn’t joyous, it was stressful. Some of the food was good, some less so, but nothing seemed to reach for the kind of greatness we wanted. “No problem” I replied enthusiastically, already dreaming of duck. The first dish he served us is on our menu almost unchanged: freshly shucked oysters, dressed in a homemade beer vinegar, dry hopped like a beer. He selected hops with citrus notes to specifically pair with one of our citrus infused beers! The duck appeared as a mousse, sausage, and roulade. Finally, there were donuts stuffed with aromatic, citrusy, and slightly bitter hop jelly. 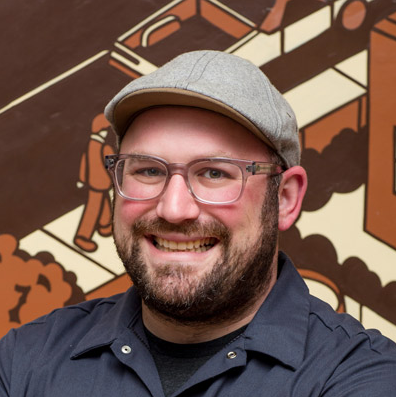 With Chad at the helm, we found a way into what beer and food would mean together at Almanac. A true San Francisco restaurant built upon the things that matter: whole hog butchery with great local pigs. Farmers market visits every weekend to gather produce from the same farms that inspire our barrel-aged beers. Beer not only being a part of the meal at service as a pairing, but at every step along the way. Beer vinegars, variety-specific hops infused salts and sugars, beer worked into the farce for of dozens of charcuterie projects with their own fermentation. Beer as inspiration not only for the pairings, but for the food itself, with fermentation winding its way through every process. A seasonal menu with beer in its soul, on the table, and in the pantry. A great dish, just like a great beer, starts with an idea. A simple kernel of ingredient, of flavor combination, or riff on a classic—a vector that sets the dish off being original. Great food both excites and comforts, challenges and reassures, feeds the mind, soul, and stomach. My very favorite dishes are rooted in memory: pulling on threads of tradition and childhood, pulling from the past to create something now. So we asked the question: can food pull upon memories of beer? Can a basket of fries remind you of your favorite IPA? Our hop salt fries start with small bags of kosher salt that are weighed out in vacuum-sealed bags with 2016 harvest Citra hops from Yakima, Washington. We tested Mandarina, Mosaic, and Simcoe salt, too—Citra popped the most with a great lemon-lime aroma. They're stored in our fridge, and new packets are opened almost daily, to keep them fresh. Just like in IPA, hop aromas are volatile and ephemeral. We’ve learned to treat the hop salt like IPA: small batches, stored cold, served fresh. Fries are pulled from the frier, dropped in a large bowl and tossed with the freshly opened hop-laced salt. All of the actual hop material is picked out, to prevent any bitterness. A quick toss and the hot fries activates the hop aromas, and a wave of citrus and pine wafts from the fried potatoes. The hop salt fries survive the menu update, and stay on for the summer. “Shouldn’t we be cooking with more beer?” our sous asks. Our meeting breaks and each cook takes their assignments to start making test dishes for the kitchen to taste, critique, and improve. Developing new menu items is a team sport, where ideas and plans meet the reality, and ideas for dishes have to be broken down into component parts, prep lists, kitchen stations. Refining a dish is like refining a beer: make it again, only better. It feels like Almanac has come full circle: we started as a brand aimed at beer for restaurants. Today, we’ve become a full-fledged restaurant striving to build an editorial vision of what beer and food can be together. Of course, it’s far from static. New beers come online almost every week, either a fresh IPA bursting with hop aroma, or a new barrel-aged sour, liberated from its wooden vessel. The menu is in constant flux: ideas are being tested, fruits and vegetables come into and drift out of season. Line cooks had a great taste or idea or dream about rutabagas. It’s a constantly evolving creative endeavor, but one that circles back again and again from the same central core ideas: this beer and food should say something, editorialize, reach for greater pairings, become more than the sum of their parts. Hops, malt, water, fermentation, kitchen prep lists, daily bread delivery, kosher salt, hanging salumi, and the new kitchen intern: they all pull from and add back to the beer. Beer is our house flavor that binds it together. Beer ultimately has always been about more than just the liquid. It’s about the community that surrounds it, the freshness and story of how the beer has been treated, the people you share a bottle with and, of course, the food that adds to the experience. Beer draws heavily on context. At our taproom, we’re taking small steps to integrate these things tighter together, to create pairings and an environment that means something, provides a point of view, an editorial voice. Beer is in our space, our tap lines and our recipes. In wine they have a word for how the environment influences flavor: terroir. In our taproom and kitchen, beer is our terroir.